Many conflict studies link the sources of social conflicts to sentiments of relative deprivation. They typically regard formal democratic institutions as states’ most important vehicle to reduce deprivation-motivated armed conflict against their governments. We argue that the wider concept of good governance is better suited to analyze deprivation-based conflict. 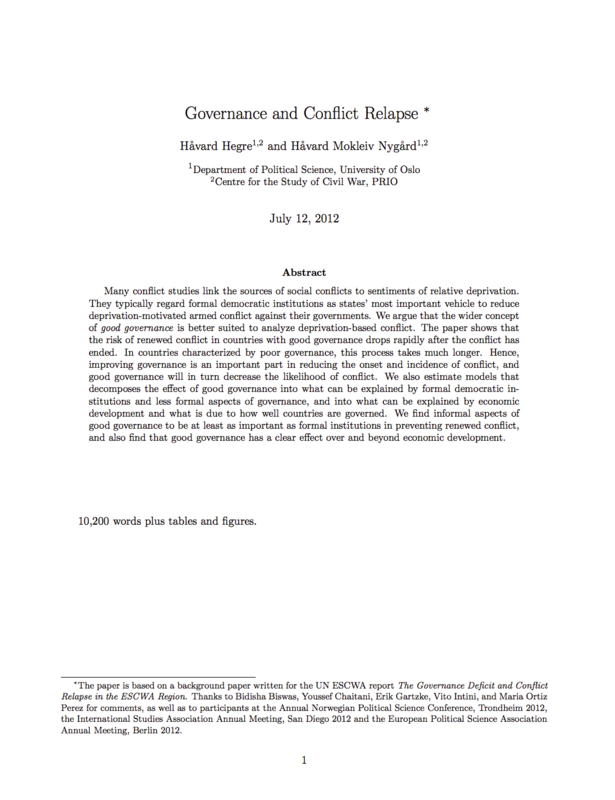 The paper shows that the risk of renewed conflict in countries with good governance drops rapidly after the conflict has ended. In countries characterized by poor governance, this process takes much longer. Hence, improving governance is an important part in reducing the onset and incidence of conflict, and good governance will in turn decrease the likelihood of conflict. We also estimate models that decomposes the effect of good governance into what can be explained by formal democratic institutions and less formal aspects of governance, and into what can be explained by economic development and what is due to how well countries are governed. We find informal aspects of good governance to be at least as important as formal institutions in preventing renewed conflict, and also find that good governance has a clear effect over and beyond economic development.